The next market Apple should set its sights on is the $31 billion television set market, writes Gene Munster and his team at Piper Jaffray in a note for clients today.As televisions become fully connected devices in the next 2-4 years, Apple is well positioned to take advantage says Gene. Consumers are shelling out over $2,000 for their television, blu-ray, cable package/cable box, gaming system and stereo equipment. 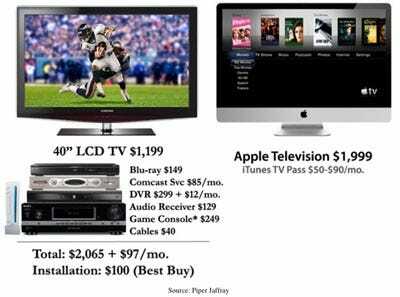 Apple could deliver a comparable television with all those features built in for $2,000 according to Gene’s estimates. Right now, Apple’s cheapest 27″ iMac goes for $1,700, so it might a little optimistic to think we’d get a 40″ Apple TV for $2,000 in two years. Of course, the TV could be stripped down a bit in terms of power. A high price tag wouldn’t have to be a killer, though. Gene notes Apple has a rabid following and a history of selling electronics at a premium price. Don’t forget, in 2005, most outsiders wouldn’t have thought it could sell a smartphone for $600 a pop. But then the iPhone came along. A big hurdle would be live television. Add in a cable package and Apple’s value proposition goes down. Gene thinks Apple could try creating an iTunes TV Pass at $50-$90 per month to compensate. The challenge there: So far, no big television or movie studios are willing to get on board with Apple. Plus, that doesn’t address the real problem — no LIVE television. People love watching sports on their HD TVs. Apple could add a port in the back for cable, but that isn’t Steve Jobs’ style. He’s sort of a control freak. It’s great at building software. A nice operating system with a browser combined with iTunes on a television would be something Apple could do better than, say, LG. Google’s already making moves into the TV market. Apple doesn’t want to give up ground. It could integrate gaming, which is becoming a big part of Apple’s business through the iPhone and possibly the iPad. An Apple TV could work with iPhones, iPods, and iPads offering customers a portable television solution. Apple is a huge company. Finding new lines of business that can contribute seriously to revenue is hard. Selling televisions would work.